Is Lascelles on the Way Out? Who Could Replace Him? | NUFC Blog. Jamaal Lascelles was one of Newcastle United’s key players in the 2017-18 season as the Magpies managed to stave off relegation and consolidate their place in the Premier League. Needless to say, there are now rumours circulating that the solid central defender could be on his way to a bigger club. Tottenham Hotspur are preparing for the possible sale of Toby Alderweireld this summer and will need to bring in a replacement for the Belgian. Liverpool and Chelsea are also looking for extra additions to help them tighten up at the back. If Lascelles does depart, it would leave Rafa Benitez with big shoes to fill at St James’ Park. Lascelles made 33 appearances for Newcastle last term and was a crucial component of the side which ended the campaign in a respectable tenth place. The Derby-born player scored three goals in the top flight and impressed with his strong organisational skills at the back. The 24-year-old has grown as a player under Benitez, and some suspect that he would have earned a call-up to the England national squad for the World Cup this summer if he played for a bigger club. As Lascelles is an English-born player, there are going to be numerous elite clubs in the country interested in signing him. The £49.5 million Manchester City deal for John Stones in 2016 highlighted how sought after English players in this position are. Newcastle conceded 47 goals in total in the 2017-18 campaign, which is only nine more than Liverpool and Chelsea, and eleven more than Spurs. All of those top six clubs have shown defensive frailties recently, and are in need of reinforcements at the back. Lascelles is currently at 6/4 in the Premier League betting to leave the Magpies in the summer transfer window, and the player may be seeking a move to further his career. He certainly will have looked at Gareth Southgate’s defensive options and considered himself as a worthy candidate for a role in Russia. This will have made Lascelles realise that a step up to one of the top clubs could be the only way to make the Three Lions squad. If Lascelles does depart, Benitez will have to bring in a worthy replacement to continue the team’s solidity at the back. There is no doubt that the Newcastle captain will demand a hefty transfer sum, but the Spanish manager may want to reinvest some of this in other key areas of his squad. For this reason, Newcastle may look to the Championship when recruiting a replacement. Leeds United’s Pontus Jansson is one name which is frequently linked with a move to the top flight. The towering defender has become a key player for the Yorkshire club over the last two seasons, and his performances have earned him a call-up to the Swedish international squad for the World Cup. Jansson could be ready to make the step up to a Premier League club and could be tempted to join a side of Newcastle’s stature. Benitez will be desperately hoping he can hold on to Lascelles this summer but will have to think of a contingency plan for if a bigger club does come knocking. Looking to the Championship for reinforcements could be the way forward. NUFCBlog Author: Frankly Various	Frankly Various has written 29 articles on this blog. 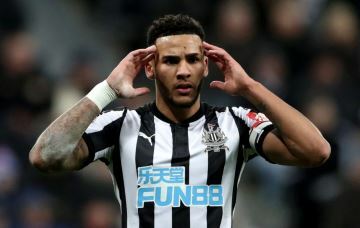 Can Lascelles restore his reputation after insulting fans (and women)? Can Jamaal Lascelles Break into the England Squad?